This book provides a broad overview of what is needed to run hospitals and other health care facilities effectively and efficiently. All of the skills and tools required to achieve this aim are elucidated in the book, including business engineering and change management, strategic planning and the Balanced Scorecard, project management, integrative innovation management, social and ethical aspects of human resource management, communication and conflict management, staff development and leadership. The guidance offered is exceptional and applicable in both developed and developing countries. Furthermore, the relevant theoretical background is outlined and instructive case reports are included. Each chapter finishes with a summary and five reflective questions. Excellence can only be achieved when health care professionals show in addition to their medical skills a high level of managerial competence. 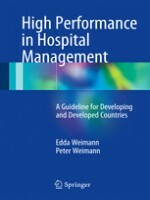 High performance in Hospital Management assists managers of health care providers as well as doctors and nurses to engage in the successful management of a health care facility.This book provides a broad overview of what is needed to run hospitals and other health care facilities effectively and efficiently. All of the skills and tools required to achieve this aim are elucidated in the book, including business engineering and change management, strategic planning and the Balanced Scorecard, project management, integrative innovation management, social and ethical aspects of human resource management, communication and conflict management, staff development and leadership. The guidance offered is exceptional and applicable in both developed and developing countries. Furthermore, the relevant theoretical background is outlined and instructive case reports are included. Each chapter finishes with a summary and five reflective questions. Excellence can only be achieved when health care professionals show in addition to their medical skills a high level of managerial competence. High performance in Hospital Management assists managers of health care providers as well as doctors and nurses to engage in the successful management of a health care facility.